Martin Bormann was born into a lower middle-class family in Prussia in 1900. In 1918 he was conscripted into the Imperial German Army, but World War I ended just weeks after his arrival on the Western Front. After the war, Bormann took up with a radical Freikorps unit, which was implicated in the assassination of several union leaders. In 1924 Bormann reportedly worked to undermine the French occupation of the Ruhr; he served time in prison after assisting with the murder of one of his former teachers. In 1927 Boorman became a member of the NSDAP; two years later he married the daughter of Walter Buch, an influential NSDAP judge. The union with Gerda Buch propelled Bormann into the upper echelons of the Nazi Party. By late 1933, Boorman had risen through the ranks to become both a party Reichsleiter (‘state leader’) and a member of the Reichstag. Through the 1930s he worked as personal secretary to deputy leader Rudolf Hess while managing Hitler’s personal finances, including the collection of royalties on the Fuhrer’s writings and images. When Rudolf Hess fled Germany to England in 1941, Bormann was elevated to lead the party chancellery. In 1943 he became Hitler’s secretary and assumed control of the fuhrer’s schedule and personal affairs. Bormann was a meticulous organiser – but he was also adept at manipulation and intriguing. His position allowed him to dictate who had access to Hitler and for what reason, giving him considerable power. Boorman also became one of Hitler’s most trusted sources of information, which he exploited to isolate and alienate other party members. Boorman’s unrestricted access to Hitler, and his willingness to exploit it for his own ends, made him deeply unpopular with other members of the Nazi inner circle. Bormann remained by Hitler’s side in the Reichsbunker until the Fuhrer committed suicide on April 30th 1945. Bormann attempted to flee Berlin straight after but vanished. The Nuremberg tribunal, believing Bormann to be alive, tried him for war crimes in absentia. For years Bormann was deemed a fugitive war criminal, hunted and pursued by both the West German government and Israeli ‘Nazi hunters’. In 1998, DNA testing on a skull uncovered by construction workers 26 years earlier proved it was that of Bormann, evidence that he probably committed suicide a day or two after fleeing Hitler’s bunker. 1. Martin Bormann was a radical nationalist and Freikorps member who resisted the French in the Ruhr in 1923-24. 2. He joined the NSDAP in 1927, finding his way into the party elite by marrying the daughter of a prominent Nazi figure. 3. During the 1930s Bormann was secretary to Rudolf Hess and also had a role managing Hitler’s personal finances. 4. His importance increased following Hess’ 1941 flight to England, after which Bormann became Hitler’s personal secretary. 5. Bormann was trusted by Hitler, something he exploited for his own ends by controlling the flow of both people and information to the fuhrer. 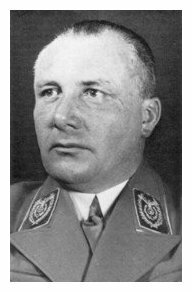 J. Llewellyn et al, “Martin Bormann”, Alpha History, accessed [today’s date], https://alphahistory.com/nazigermany/martin-bormann/.